Photo: Chief Steve Taylor holds the newly signed Tr'ondëk Hwëch’in Self-Government Agreement and Final Agreement. Credit: Tr'ondëk Hwëch’in Archives. 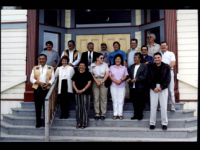 Tr'ondëk Hwëch’in signed their Final and Self-Government Agreements on July 16, 1998. To celebrate the 20th anniversary of the signing the Tr'ondëk Hwëch’in developed 20 fun facts about the negotiation and signing of their agreements. Read all the facts to learn more about Tr'ondëk Hwëch’in’s journey to self-governance. 439 voters out of 475 voted YES to approve the Agreements—that means 92% of persons who voted, voted YES! For the purposes of 6.1 of the TH Final Agreement, which provides that persons who did not vote were effectively considered to have voted no, 76.2% of eligible voters voted yes. This was, and remains by far the strongest endorsement for any land claims agreement in the Yukon and, as we know, in Canada. 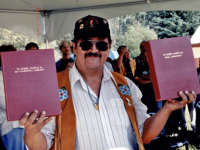 There were two signatories of the Tr'ondëk Hwëch’in Final Agreement: Chief (at the time) Steve Taylor and former Chief Percy Henry. Both men were huge contributors to the push for self-government. 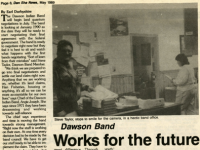 "I think some of the decisions and some of the things we have moved ahead has been very helpful to other First Nations and that they can follow along behind and benefit…from some of the trail blazing that we’ve done," said Chief Steve Taylor on the work that the community did for self-government (2008). Don't forget about the amazing women who were a huge part of helping us get where we are today! There were 13 witnesses to the signing of the Tr'ondëk Hwëch’in Final Agreement. The first three witnesses were former Chiefs Peggy Kormendy, Hilda Titus, and Angie Joseph-Rear. 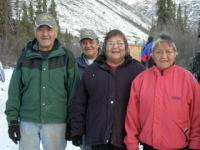 Aside from Steve Taylor and Percy Henry, these three women were all of the living TH chiefs. Every person who was at one time a TH Chief signed or witnessed the Agreement. The four TH Councillors of the day—Robert Rear, Art Christiansen, Duane Taylor, and Fred Taylor—also witnessed the signing of the Tr'ondëk Hwëch’in Final Agreement. Four of the remaining witnesses were chosen so that all major TH families were represented. These families were represented by Edward Roberts, Karen Farr, Trudy Lindgren, and Ronald Johnson. Check out those youthful faces! 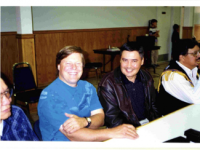 The final two witnesses of the Tr'ondëk Hwëch’in Final Agreement were TH land claims grunts, Ed Kormendy and Tim Gerberding. Bonus fact: after 26 years of service, Tim retired in 2017. Mähsi cho, Tim, for all your hard work! Fact #6 features a citizen who has worn a few hats since TH became self-governing. Darren Taylor was a major player who did not witness the signing of the Tr'ondëk Hwëch’in Final Agreement. Instead, Darren signed the TH Settlement Land Maps. Not long after that in 1998, Darren became Chief! Now, 20 years later, he's still working on those maps at the Natural Resources department. "It’s really a fine balance. While we look at development and economic development, we also have to respect our history and our culture and our historic sites that we have out on the land and ensure that the integrity of those sites are maintained or taken into consideration when we look at developing any particular piece of land. And then continuing to provide an adequate level of programs and services to our citizens," Darren said on implementing self-government. The movement toward self-government was a community effort. Fact #7 recognizes those efforts. A big part of the amazingly high turn-out of voters was thanks to the work of the Ratification Committee, which included Margie Kormendy, Wendy Cairns, John Ferby, and Art Christiansen. 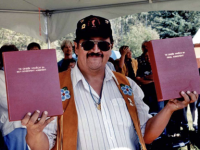 The Ratification Committee provided Tr’ondëk Hwëch’in citizens with a package of information, which consisted of a book summarizing the Umbrella Final Agreement (commissioned by the Council of Yukon First Nations), a copy of Tr’ondëk Hwëch’in Final Agreement and Self-Government Agreement, and a video narrated by Tr’ondëk Hwëch’in Chief Steve Taylor about the Agreements. Every possible action was taken to find Tr’ondëk Hwëch’in people and provide them with a copy of the ratification package within a 90 day period. Another big part of the strategy for getting all of those yes votes was to talk to the major TH families and hold workshops to communicate in simple terms why it was so important that they vote and what self-government would mean for citizens. Debbie Nagano (née Kormendy), TH’s Heritage Director, and her brother Ed Kormendy, Lands Director at the time, belong to one of the families who voted to make TH a self-governing First Nation. Their whole family was involved, talking about what the agreement would mean for them and encouraging each other to vote yes because they knew that they had to be unified. “To pass those documents you had to get those big family groupings and make sure that the majority of the family voted, and you had to know how each other were going to vote. It had to be done globally, not individually … It’s not just moving one individual forward; it’s moving the whole community,” says Debbie speaking about how her family. At the behest of the Department of Indian Affairs, most Yukon First Nations had an elected Chief and Band Council by the late 1950s. The Moosehide community, however, anticipated this trend by over 30 years and elected a council in 1921. Using traditional chieftainship combined with the Indian Affairs approach, the people of Moosehide established a simple, yet effective government that allowed Tr’ondëk Hwëch’in to maintain their traditional values while mediating with the new government (Canada) on behalf of their community. 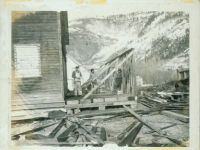 Although there were probably times that the Council was more active than others, it continued until the early 1950s, shortly before most people moved to Dawson. In February 1973, several Yukon leaders, including Percy Henry who was chief at the time, presented Prime Minister Pierre Trudeau with the document Together Today for our Children Tomorrow: A Statement of Grievances and an Approach to Settlement by the Yukon Indian People. This was the first comprehensive claim to be submitted to the Canadian government by any First Nation group and the Prime Minister at the time, Pierre Trudeau, accepted it as the basis for further negotiations. The document laid out Yukon First Nations' history and presented a way forward, setting in motion the modern land claims process. “First, remember, there were never any wars between Indian and White in the Yukon. Second, remember, there were no treaties signed in the Yukon. Third, remember, the first Indian Act was designed to protect the Indian from the Whiteman. This concept was never applied in the Yukon. These three things are important, because they combine to make the YUKON claim different from other Settlements. 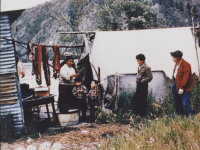 The objective of the Yukon Indian people is to obtain a Settlement in place of a treaty that will help us and our children learn to live in a changing world. 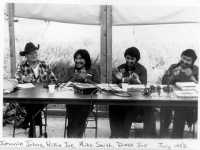 In 1989, the Council of Yukon Indians signed an Agreement in Principle, a document that made self-government possible. An earlier agreement had been negotiated, but was rejected in 1984 because of deal breakers such as land, extinguishment of Aboriginal rights, and the fact that only status Indians counted. The new 1989 agreement provided for more land than the rejected 1984 one, for the recognition of Aboriginal title on those lands, and the development of a model of self-government. In 1990, the Umbrella Final Agreement was signed. This document was the framework for Yukon First Nations to negotiate our Final and Self-Government Agreements. 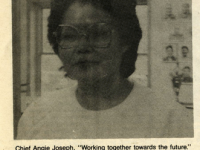 Angie Joseph-Rear, Chief at the time, described the amount of work that went into negotiating these agreements. “It was an intense negotiation. It was Umbrella Final Agreement. So it was throughout the night. And we have maybe—Federal government have about 10 negotiators and lawyers and YG had the same, but we had our own people. We had Dave Joe as our lawyer, and we had Victor Mitander as our chief negotiator. And all the chief are behind them. So we had to go and sit through all the negotiation—this the truth, that we go, we take turns to sit through the night and all. And, yeah, I called Steve Taylor and said, ‘gonna need you, so we really want you to come.’ We completed it five o’clock in the morning. 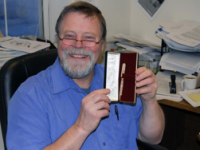 Photo: Tim holds up the pen he used to sign the 1998 Final and Self-Government Agreements. All of the signatories of the agreement signed the pen case. Credit: Tr'ondëk Hwëch’in Archives. So many small details had to be hammered out during the Umbrella Final Agreement negotiations. 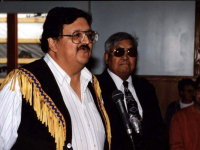 By 1992, four Yukon First Nations had negotiated their Final and Self-Government Agreements. Tr’ondëk Hwëch’in had land selections under way since the 1980s and we were ready to proceed with negotiating along with Selkirk First Nation, and Little Salmon Carmacks. 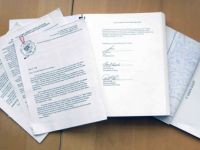 The intensive negotiating period began in February 1992 and documents were delivered for legal and technical review in May 1997. One of the many challenges was developing the special provisions, including the selection of specific lands. Tim Gerberding, who was one of the land claims negotiators at the time, told us about his contribution to the Umbrella Final Agreement. “My part in the UFA was rather small, but it did mean something. As I said, the UFA was pretty much settled by the time I started. I did attend a couple meetings at the old Council of Yukon Indians offices on Nisutlin—which has since been razed. It was an old residential school that held bad memories for people—but nevertheless, that’s where various meetings took place. And I remember going to one meeting when people were talking about Chapter 16, which is of course the Fish and Wildlife Chapter. At the time the provisions for traplines in the chapter provided that Aboriginal people in Yukon would have no less than 70% of the traplines in Yukon. So that was the threshold that applied over the whole territory. It wasn’t broken down by area or traditional territory. “But, the difficulty with those provisions for the Tr'ondëk Hwëch’in, was that the Tr'ondëk Hwëch’in only had about 30% of the traplines in Tr'ondëk Hwëch’in Traditional Territory at the time, and in other areas, such as Ross River and Vuntut Gwitchin, the Aboriginal people had 100% of the traplines. So, they had such a very high percentage in a lot of these other areas that if the 70% threshold were taken across the boundary—the whole Yukon—it might not mean much of an increase for the Tr'ondëk Hwëch’in, who were at the time, as I see it, about 30%. Another challenge with selecting lands was the choice of Tr’ochek, an important heritage site for Tr'ondëk Hwëch’in. 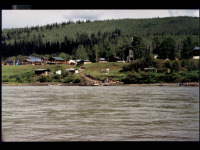 Although the site has hosted several identities since the Klondike Gold Rush, it has been an important fish camp and base for moose hunting expeditions for Tr'ondëk Hwëch’in for a long time. During the land claims process, Canada did not want TH to select any settlement land that was encumbered with mining claims, thinking (rightfully) that the mining rights could be affected. TH was not prepared to settle on that basis as the Klondike Valley was staked rim to rim with placer claims. If TH had avoided those claims, Tr’ondëk Hwëch’in—who take their name from the Klondike river—would have had no settlement land in the Klondike Valley. In 1991, TH heard that mining was occurring at Tr’ochek without a water licence. At the time it was legal to mine without a water license if there was no surficial (over the surface) discharge of water. Three TH employees took a boat to the uppermost part of the Tr’ochek flat, approaching surreptitiously by travelling up the middle of the river to well above Tr’ochek and then idling back to the upper landing. They then snuck through the trees, avoiding detection, and took pictures of the mining operation. There was a huge open pit where the mining was taking place and a vigorous flow of clear water was bursting from the pit through the gravel about 15 feet down. At the bottom of the pit, two huge caterpillar pumps were pumping the water out of the pits into an adjacent shallow pond. Two streams flowed out of the pond over the surface, one to the Klondike River and the other to the Yukon River. The TH employees took the pictures of this illegal activity to the mining recorder and a mining inspector was dispatched—but nothing happened. For three days the employees carefully monitored and recorded the activity and complained to the mining recorder, but nothing happened. The following week TH took legal action by way of interlocutory injunction (a court order to make a party stop what they’re doing until the final judgement of the case) arguing irreparable harm to the site. The mining was halted overnight. This represented a major challenge not only to the Tr’ochek claims, but to all mining and third party activity in Yukon. We asserted that the claims were illegal because they had been staked in the absence of a land claims treaty. Our argument was based on the 1870 order, which is part of the Constitution of Canada. It states that “upon the transference of the territory in question to the Canadian Government, the claims of the Indian tribes to compensation for lands required for purposed of settlement will be considered and settled in conformity with the equitable principles which have uniformly governed the British Crown in its dealings with the aborigines.” This meant that without a treaty, no third party assignments of land were valid. All were null and void. TH argued that the Tr’ochek claims were unconstitutional as no treaty had been made that settled the claims of TH “in conformity with the equitable principles.” Canada eventually agreed to settle the litigation by paying $1 million to buy out the claims. In the end, TH won and secured the Tr’ochek Heritage Site. The Tr’ondëk Hwëch’in Self-Government Agreement is a document that establishes Tr’ondëk Hwëch’in as a “legal person,” and ensures that we have a constitution which sets out our government structure. We have the capacity and ability to act and govern ourselves, but a particularly special feature about our law-making powers is that they supersede Yukon Government’s. Dave Joe, who went to Ottawa with Elijah Smith and Percy Henry in 1973 and was our chief negotiator during the Umbrella Final Agreement negotiations, explains why. “We’ve got exclusive law-making authority over the rights contained in our treaty, and matters that are internal to us—like you know, we align ourselves by clan system, that’s our exclusive law-making powers—so neither Yukon or Canada could tell us how to manage our money or land or people, etc., etc. as part of our exclusive authority under 13.1. Under 13.2, we’ve got paramount concurrent authority over citizens in Yukon and to the extent of any conflict with Yukon laws, our laws would be paramount. … And, so, it’s a very diverse power. It’s not only applicable on our treaty lands and not only applicable in our respective traditional territories, but applies throughout Yukon. So if the Champagne-Aishihik were to pass a childcare law, that childcare law would follow me and my children up to Old Crow or wherever I live in Yukon and I would have to adhere to the standards and principles articulated by the Champagne-Aishihik childcare law because it’s a law over citizens in that regard… We wanted to ensure that degree of paramouncy over laws of the Yukon. The Tr’ondëk Hwëch’in Final Agreement is a modern-day ‘treaty’ recognized in Section 35 of the Canadian Constitution Act. The Final Agreement asserts and retains Aboriginal rights, titles and interests with respect to its traditional territory and, more specifically, to its settlement lands. All Yukon First Nations have traditional territories, but only self-governing Yukon First Nations have settlement lands. For the purposes of the land claims process, Tr’ondëk Hwëch’in Traditional Territory is not legally owned by TH, but we maintain certain rights (like Aboriginal hunting rights) within the territory, and we have responsibilities and authorities regarding activities and decision-making within the traditional territory. Settlement lands, however, are legally and communally owned by the First Nation. Tr'ondëk Hwëch’in own 2,598.51 km2 of settlement land. Bonus fact: just recently, Tr'ondëk Hwëch’in and Vuntut Gwitchin Government signed an Agreement on Overlap Resolution, settling the contiguous boundary shared by each First Nation. Before, some sections of the Final Agreement dealing with natural resources were suspended until the overlap was resolved. The signing of the overlap agreement means that both TH and VG now have full authority over those sections of land. Although not all important sites are categorized as settlement land, Tr'ondëk Hwëch’in still managed to gain important rights for those spaces too. Moosehide is an important heritage site for Tr'ondëk Hwëch’in. The Hän name for this site is Jëjik Ddhä Kek’it. Chief Isaac moved the Hän people from Tr’ochëk to Moosehide in 1897 after Tr’ochek was overrun with gold-fevered newcomers. However, archaeological investigations have established that ancestors of the Tr'ondëk Hwëch’in have been using the Moosehide site as early as around 8,000 years ago. Moosehide is categorized as 91(24) land under the Canadian Constitution. This categorization of land is not quite reserve land, but Canada still retains special responsibility for it. This could make a difference if there were environmental issues that had to be addressed—Canada would have to step up to the plate. As per the Tr'ondëk Hwëch’in Self Government Agreement, Tr'ondëk Hwëch’in have the same authority over Moosehide as if it were settlement land, but we still maintain some of the rights that reserve lands get, like access to government programs. One of the biggest benefits of designating Moosehide this way was that we did not have to use a portion of the settlement land quantum we were given. Tim, our dedicated land claims negotiator from fact #14, shared a little anecdote. “Well, I don’t remember all of it, but I remember, we set up certain provisions for Moosehide, which were unique and have not been replicated. Moosehide was taken down not as settlement land, but as 91(24) land, which is kind of like reserve land, but we also ended up negotiating a tax exemption for people down there, which is quite unique. The Tr’ondëk Hwëch’in Final Agreement provides for the creation and protection for all time of Tombstone Territorial Park. On August 28, 2009, Chief Eddie Taylor and Minister of Environment Elaine Taylor signed the Tombstone Territorial Park Management Plan. The plan provides for the protection of the natural, historic and cultural resources of the Park for the benefit and enjoyment of future generations. 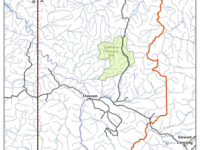 The plan was prepared by the Park Steering Committee, half of which is made up of representatives appointed by Tr’ondek Hwech’in and the other half by Yukon Government. “‘The area in which the Tombstone Park falls had been selected by TH during the land-claims process for its heritage values and importance to TH people. This proved a contentious selection for the Yukon government of the day, who wanted the area for a park. “Over the course of negotiations, a compromise was reached that proved to be a selling point for TH citizens. This compromise was enshrined in the Final Agreement: the area would be protected for all time as a co-managed, natural-environment park. The details of that arrangement are contained in the Tombstone Management Plan. There were other obstacles to overcome during the development of the plan, including the staking of mining claims in the middle of the park. 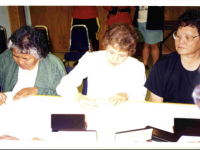 Photo: 1995 CYFN General Assembly. 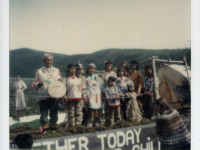 This was the first time the Hän singers sang publicly with the songs that came back from Alaska. Back row (l-r): Adam Roberts, Freda Roberts, Doris Roberts, Jason Henry, Leon Sidney, Karl Knutson, Tyson Knutson, Ronald Johnson, Benjamin Juneby, Edward Roberts, Virginia Joseph, Martha Kates, Angie Joseph-Rear. Front row: Darren Bullen? 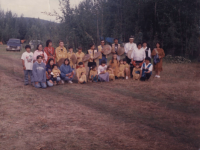 ?, Debbie Nagano, Waylin Nagano, Edith Robinson, Madeline deRepentigny, Kyrie Nagano, Krystle Roberts, Aurora Knutson, Jamie Roberts, Tamika Knutson, Carmen Roberts, Erika Scheffen, Marion Roberts Credit: Tr'ondëk Hwëch’in Heritage Department. In 2016, Tr'ondëk Hwëch’in’s vision was to “maintain our relationship to the land, preserve our heritage & culture, empower our people, and utilize land and resources within our Traditional Territory in a sustainable way that creates opportunities and prosperity for citizens.” Since Tr'ondëk Hwëch’in became self-governing in 1998, they have gradually taken on more responsibilities so they can provide more programs and services that meet these needs. As of 2018, Tr'ondëk Hwëch’in has 10 departments that serve Tr'ondëk Hwëch’in citizens. 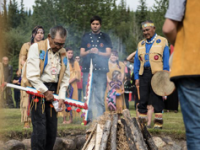 One of these departments, the Heritage department, does extensive work with Elders, Tr'ondëk Hwëch’in citizens, the Education department, researchers, and organizations such as the Yukon Native Language Centre to tell the story of the Tr'ondëk Hwëch’in and to revitalize our language and culture. Thanks to Elders, the Hän language workers, and the Education department, they have programs such as Aboriginal Headstart, and Hän language and culture is a part of the curriculum at Robert Service School. Bonus fact: the Dänojà Zho Cultural Centre, another branch of the Heritage department, is also celebrating its 20th anniversary this year! The Dänojà Zho (Long Time Ago House) teaches visitors about Tr'ondëk Hwëch’in through guided tours, displays, and performances—but we also get to enjoy the Zho with workshops, performances, events, and funny stories from Sammy and Jamie on Radio Zho! To finish off our fact #20, we’ll leave you with this powerful quote from a play written and first performed in 1996 by seven Tr'ondëk Hwëch’in women: Margaret Kormendy, Debbie Nagano, Freda Roberts, Edith Fraser, Jackie Olson, Michelle Olson, and Kyrie Nagano. The play deals with how we were separated from land and culture and the devastation that disease, residential school, and alcoholism caused. But it also tells how we drew strength from our traditions to heal and revitalize our culture when our drum and songs were returned.